Carrier vibrating screeners are designed to screen, scalp, dewater, or separate materials using a wide variety of screening media. Ideal for dry or wet screening, Carrier’s vibratory screeners can handle up to 1500 tons per hour, with many deck design options that deliver maximum efficiency. Our vibratory screeners can be manufactured to meet your needs, with customizable construction and configuration. Designed to accommodate up to five separate decks on a single vibratory screener unit. Available in single, double or triple deck designs. Grease or oil lubrication bearing system options. Tuned, two-mass, natural frequency and brute force designs. Available in widths from 6 inches to 10 feet and lengths up to 200 feet. Available with side, end, intermediate, straight, or bias discharges. 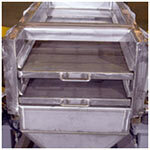 High temperature vibratory screener designs available for handling materials up to 2000 deg. 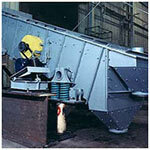 F.
Choice of vibratory screener construction from carbon steel to metal alloys. Options include removable dust-tight covers, overhead drive arrangement, liners, explosion-proof designs, etc. Available in fixed or adjustable rate designs. Supported from below or suspended from above on soft steel coil or rubber isolation springs to reduce dynamic reactions to surrounding structures. 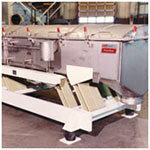 Ideally suited for wet or dry screening. Capacities range up to 1,500 tons per hour. Designed for the highest possible screening efficiency. Circular motion for increased screener efficiency – our vibratory screener units feature a two-bearing design. Carrier vibratory screeners are also available with elliptical motion drives that can solve difficult screening problems. 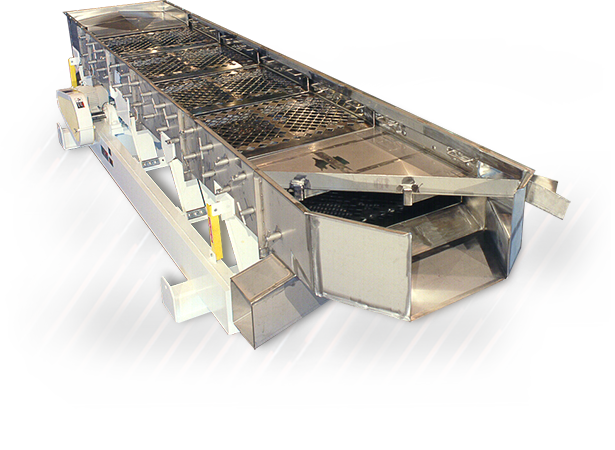 This motion provides a high rate of travel at the feed end, providing a thin material bed and rapid stratification which separates the fines quickly. At the discharge end, the material flow is retarded, giving near-size particles additional time to pass the screen. Capacities range up to 500 tons per hour. For more information on Carrier vibratory screeners and feeders, refer to brochures #16906 and #16905.